At REALTOR® QUEST 2018, I had the distinct honour of presenting various awards for the hard work and commitment demonstrated by TREB Members. 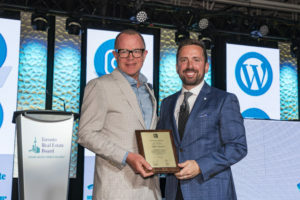 It was during TREB’s Spring Annual Meeting that the Honorary Life Award was presented to TREB’s 2015/2016 President Mark McLean of Property.ca Realty. It was for Mr. McLean’s hard work and professional representation of REALTORS® that he was honoured. The David Rossi Committee Service Award was presented for outstanding TREB committee volunteer service. 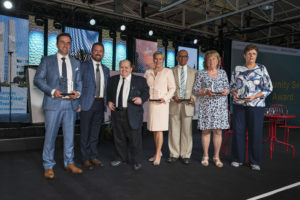 TREB Members Ricky Rathore of Re/Max Empire Realty and Tony K. Sobczak of Royal LePage Connect Realty, were this year’s winners. Ricky Rathore has served on the Young Professionals Network Committee for the past two years and has been a consistent and outstanding ambassador for TREB’s YPN. Tony K. Sobczak first served on TREB’s Finance Committee in 2011-2012 and has sat on the Committee a total of four times, most recently 2017/18. The final presentation was the Community Service awards, which recognizes our Members for their outstanding service in the community. 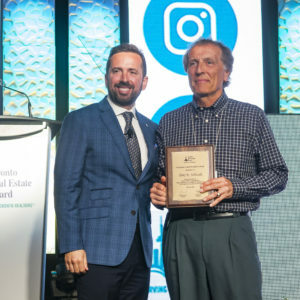 Needless to say, you hear about REALTORS® who work in communities all over the greater golden horseshoe, but not often enough do you get to hear about the work they do that goes far beyond the job of buying and selling real estate. Jennifer Burton of Royal LePage Estate Realty: Strong supporter of the Royal LePage Shelter Foundation since 2005. In that time, she has helped to raise $330,000 – funds which have been distributed within her community to both the WoodGreen Red Door Family Shelter and the Scarborough Women’s Centre. Jennifer has also volunteered her time to Community Centre 55 and the Beaches International Jazz Festival. This past year, Jennifer’s leadership helped raise over $50,000 for the Royal LePage Shelter Foundation, and she also hosted a Toy Drive which raised $5,000 to support the holiday programs at Community Centre 55. Andrew Ipekian of Keller Williams Referred Urban Realty: Andrew used his influence as a real estate broker to raise awareness and help local charities in the GTA. In February 2018, Andrew and his team raised $10,150 for the Covenant House Guts and Glory event by competing in a challenging obstacle course with proceeds going to the Covenant House in support of homeless youth. In 2017, Andrew and his team raised $50,000 for Covenant House by sleeping on the streets of Toronto in a fundraiser called Sleep Out. In 2016, he raised $16,000 for Second Harvest by auctioning off free real estate services. Javaid Ali Khan of HomeLife/Bayview Realty: Active Member in the community for years. He has served on several hospital and public sector boards, including raising funds for several hospitals. In March 2017, Javaid climbed Mount Kilimanjaro and raised $30,000 for Scarborough Midwifery and Maternal Newborn program through this venture. He also served as a board member and treasurer for the Markham South Asian Seniors Centre, promoting seniors’ trips, activities and programs. Maria Natale of Royal LePage Porritt Real Estate : Maria has been serving her community for the past 24 years through her volunteerism with Ernestine’s Women’s Shelter. Each year, as “Santa,” Maria collects, giftwraps, and delivers up to 75 gifts for shelter residents to ensure every woman and child receives an appropriate gift. Liz Porrit of Royal LePage Porritt Real Estate: For the past 27 years, Liz has been the engine and driving force of the Etobicoke Lakeshore Santa Claus Parade. This parade would not happen without Liz, as she’s the one who spurred it on. From finding volunteers, sponsors, advertising, building community engagement, promoting local business involvement, and even right down to safety concerns/permits, it has been Liz’s constant efforts and devotion that has kept the parade going over the years. Liz’s greatest motivating factor is seeing how much the children of the community enjoy attending. Paul Swartz of Sutton Group Old Mill Realty: For over 40 years through his contributions to the Greenborough Rate Payers Association and the Greenborough Community Church, Paul has been serving the community. Over the past year, Paul has sponsored a “6 kilometre walkathon” annual fundraiser, and an annual BBQ. During the course of these fundraisers, Paul intermingles with hundreds of people, who all know he is a REALTOR®. At these events, Paul spends time with the community, explaining mortgages as well as landlord and tenants’ rights issues. Additionally, Paul has taught real estate as a career on a pro bono basis to young people at Toronto Secondary School in Toronto’s west end. Congratulations once again to all the recipients and thank you all for your incredible service and devotion. The post TREB Awards appeared first on TREB Wire .